When I talk about the carnival I do that in a broad sense. The headline could very well have been “the popular feasts” or “ritual festivities”. I talk about the entire official feasts; religious (like Easter or feast of fools), pagan (like Midsummer or Mayday), official (like coronations or triumphal procession), private (like weddings or birth celebrations) or others (like great markets or times for Mystery plays). 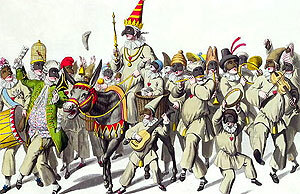 The actual carnival, that we usually mean, happens as a final feast just before lent. The word actually means farewell to meat. It is the kind of feast we can find all in all times over the world – like the Indian” Holi”, the Roman “Saturnalias” or “Boruca” in Costa Rica – that puts the normal life up-side-down, where social, sexual or gender structures and hierarchies are put aside in favor of the great feast. 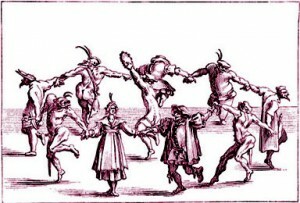 By the end of the time of carnival the “King of Carnival” gets challenged in a fray, by Lent (personified) or gets put to court where he is sentenced to death. But before he gets killed he reads his last will. Reading the will, wish also was the peak of the carnival, is where he mocked the rulers, bishops and everyone who had done something wrong during the year. And finally he was ritually killed; usually a puppet or an animal, like a bear, a donkey or a goat was burned or thrown down from something tall. Note that it is not a sad event that the King of Carnival dies. As the carnival comes from old pagan rituals of spring, he also is represents the old world (the old year, the winter) that must die to give birth to the young and new for the world to be reborn. That is the standard scenario for the carnival. Other ritual feast was celebrated with much the same components. Off course they followed their own scenarios; the may feast was a fertility ritual, with its sexual content of wowing and cheating of the old man that stood in the way; the feast of fools, that was all about satirizing the church; the Diavolos of the Mystery plays, who played and acted with the people on the streets, and so on. The common theme, except from how the everyday life turned up-side-down and changed into a life of rejoicing , laughter and play, is the how different rites where everyone was a participant slowly began to take form into acted stories where actors and audiences became more and more separated. It started as today’s “trick or treat” or “wedding ceremonies”, but slowly grew into more complex performances and shows. There is also a great mask tradition emerging from the carnival. In most Carnivals, all over the world, there are masks involved. The oldest mask from the Venetian carnival (which originated in 1162) – Mattaccino, the egg thrower – is first recorded in 1268.